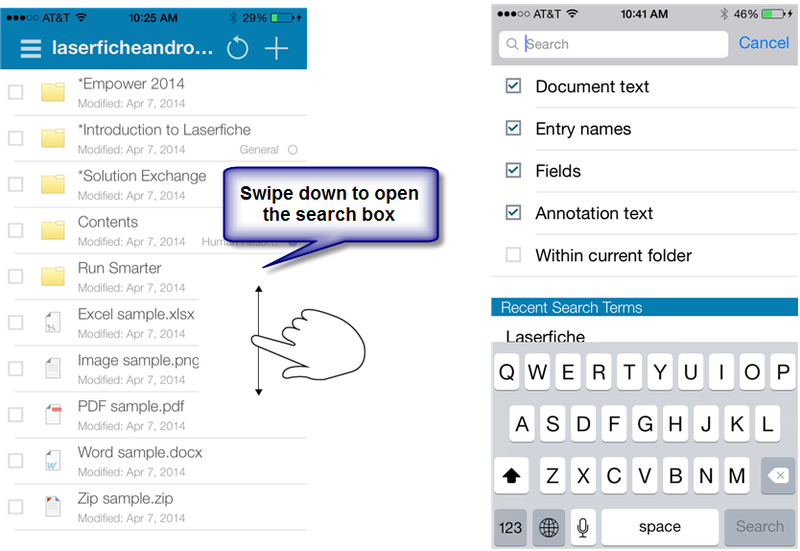 Laserfiche Mobile 9.1.1 brings several exciting features to the iPhone, iPad, and Android apps, like recent searches and viewing a document’s annotations. In addition, the iOS app has been redesigned to be easier and more intuitive to use. 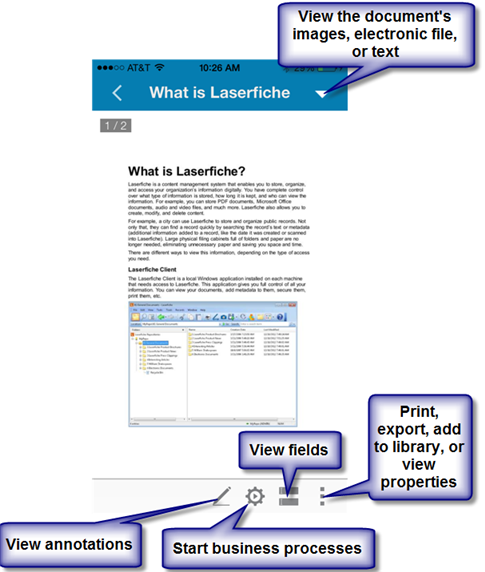 If you’re updating to Laserfiche Mobile 9.1.1 on your iPhone or iPad, here’s what you need to know to get started with the latest version. The toolbars are redesigned. When browsing the repository, you’ll only see one toolbar at the top of the screen. If you want to switch from browsing the repository to viewing libraries or recently uploaded files, tap the menu button and make the appropriate selection. 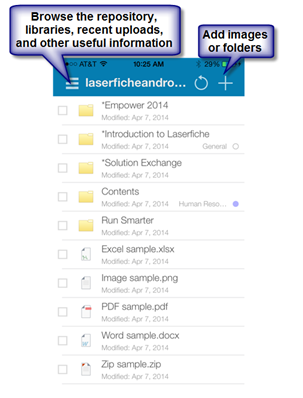 To create a folder or add a document, tap the Plus button. To search, swipe down in the folder browser. Search options appear after you tap the search box. The 9.1.1 app includes a list of recent search terms, making it easy to repeat your searches. The toolbars in the document viewer have been updated, too. Use the drop-down next to the document’s name to switch between viewing the text, image, or electronic file. 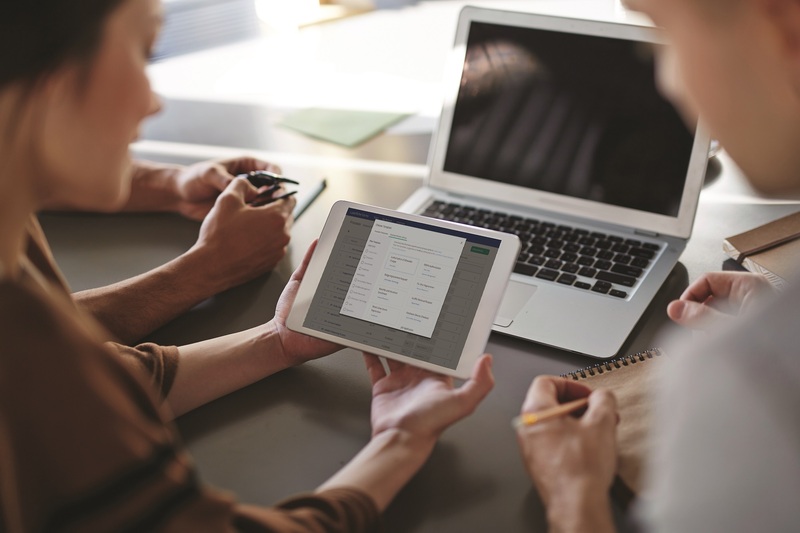 The bottom toolbar allows quick access to the document’s annotations, associated business processes, and fields. Tapping the menu button displays more options for interacting with the document.